Chisholm Trail Casino is a governmental enterprise of the Chickasaw Nation, (“Nation”) a federally recognized sovereign Indian tribe. Chisholm Trail Casino is giving away over $30,000 in Cash, Bonus Play and Prizes during the “GET GREEN $30K” giveaway. Patrons must be 18 years of age or older with a valid photo I.D. and must be a Chisholm Trail Casino Players Club card member, with complete and accurate account information, to participate. The following individuals or entities are not eligible to participate or win during this promotional activity: employees of Chisholm Trail Casino; employees of the Nation prohibited from participating as set forth by any of the Nation’s policies, regulations, or laws; anyone who has been barred from any of the Nation’s gaming facilities; or any promotional sponsors. Beginning Saturday, March 30, 2019 through Friday, April 26, 2019 Patrons will be able to earn entries in the following ways. Patrons will receive one (1) entry for every five (5) points earned on their Chisholm Trail Casino Players Club card. Partial entries will not carry over once drawings begin. Patrons who are new card sign ups during the promotional period will receive one (1) entry upon initial enrollment. Every Tuesday and Thursday throughout the promotion Patrons will earn entries at 2X the rate. Selected Patrons receiving offers via any direct marketing initiative will be able to redeem offers for additional entries and/or a single entry as specified on the offer. On Fridays, April 5, 12, 19, and 26, 2019, random drawings will be held between 6:00pm to 11:00pm, a total of $3,500 in cash and Bonus Play will be given away each night in denominations of $300, and $400. 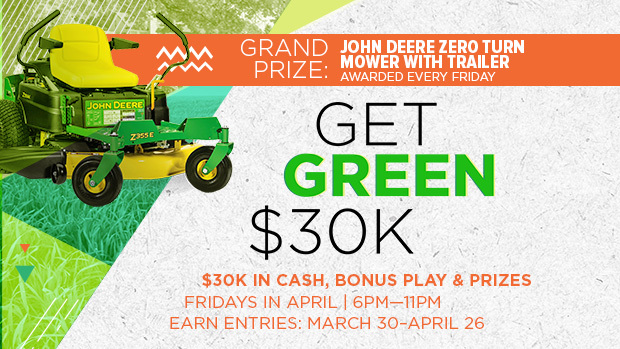 At approximately 11:00pm each night, one (1) Patron will be awarded a Grand Prize of a John Deere Z355E/48A Ztrak Zero Turn Mower with trailer (valued $4,099). Patrons are responsible for activating their entries by properly inserting their Chisholm Trail Casino Players Club card into an electronic gaming machine, and removing their Chisholm Trail Casino Players Club card from the machine within one (1) hour of each drawing time. Patrons must activate their entries to be eligible to win. Patron(s) must be present to win. Winner(s) will be announced and have two (2) minutes to respond to the promotions booth and accept prize. However, if the announced winner does not respond within the allotted time or does not accept prize a new winner will be drawn. Patrons will be limited to winning one (1) preliminary prize each night. All Patrons will be eligible for the Grand Prize, but limited to one (1) Grand Prize per Patron. Chisholm Trail Casino’s casino management system will be the sole determinant of each winner. Winners must provide a valid ID and Players Club card to be deemed an official winner of any promotional drawings. Bonus Play is valid from 6:00pm to 1:59am on each of the aforementioned drawing dates. All Bonus Play is non-cashable and downloadable to any participating electronic gaming machine. Acceptance of prize constitutes winner’s permission for Nation to use his/her likeness or name for publicity or promotional uses without compensation or notice. Winner must agree to sign a publicity release form before prize will be released.